I love stumbling across unique snacks, especially when they are good for you. A recent search for dried bananas for Bella lead me to stumble across Barnana, the original chewy banana bites. In addition to their original gluten-free, vegan chewy banana bites flavor, they also offer chocolate chewy banana bites. I like to think that they knew my chocolate banana search would lead me to their page. :-) Yes, I am a chocoholic and I am not ashamed to admit it. 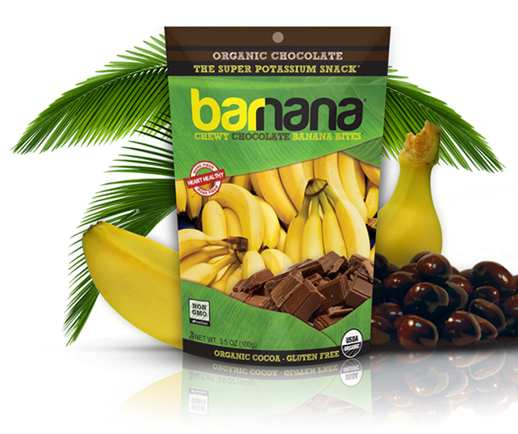 And, when it comes to looking for new snacks or foods online, I always like to through the word "chocolate" in front and see what I come up with...and, in this case it was Barnana chewy banana bites, which are also raw and dairy free, and a great super potassium snack, for kids and adults. 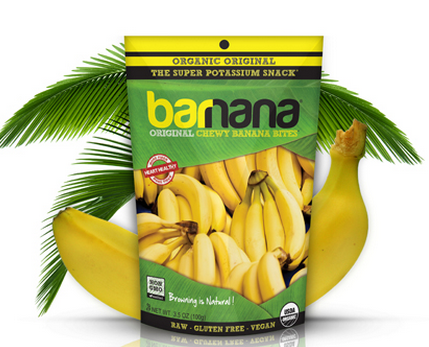 "Barnana only uses whole, organic ingredients. When you eat Barnana, you are getting the pure wholesome nutrition that your body needs with no chemicals and no preservatives. The healthiest, best tasting food on earth comes in its organic form. Aside from helping you be healthy, growing organically also helps our planet stay healthy too, allowing our ecosystems to flourish with all kinds of life." "Barnana has no wheat, no oats, and no forms of gluten. We are gluten free because there is no treatment for those with celiac disease besides following a gluten-free diet. Celiac disease affects about 1 in 133 Americans, we’ll keep you healthy and feeling good." This heart healthy and rich in fiber snack is perfect for busy parents like myself who are always on the go or forgetting to grab breakfast in the AM, and need a pick me up snack mid morning. The two 3.5 oz. bags I was sent lasted a few days, as you can get full off of just eating a few of these chewy banana bites. The recommended serving suggestion per 3.5 oz bag is about 8 pieces, enough for 2.5 people to enjoy. And, at only 110 calories you can't go wrong for this healthy snack on the go. You will also find 4 grams of fiber and 2 grams of fat per 3.5 oz. bag. And, if you are worried about sugar, don't be as you will only find 16 grams per 3.5 oz, which is low for a snack food. As I was snacking on these chews with Bella, and then my husband when he arrived home from work, I couldn't help but read the back of the bag and like what I saw. *20 vitamins and minerals to support your immune system and help your body grow. As I read the above, I thought to myself "I have never all these great benefits from a snack food that actually tasted good. It wasn't chalky or left you with a funny taste in your mouth. Instead, each chew tasted like a fresh banana, just in a more chewier consistency. While I had hoped Savannah would have tried them, I am happy to have found another great snack option for Bella. And, because they come in small bags like the 3.5 oz one I was sent, I can store them in pantry and grab a few when we are running errands, so that i have an on-the-go snack for the family, that is not only delicious, but good for us, too. If you love bananas, or are looking to add more healthier snack options to your families diet, or even want to add a new treat to your child's lunch box, why not check out Barnana chewy banana bites, available in both original and chocolate flavors. Visit http://barnana.com/ to learn more about these raw chewy banana bites, including where to buy at a store near you, or even online through their online store. Great healthy snacking option. I would use this to put in yogurt. I love that it is 100% raw. I love to eat bananas for a healthy snack so I would love to try these. I love that they do not have any sugar, preservatives or chloresteral in them.